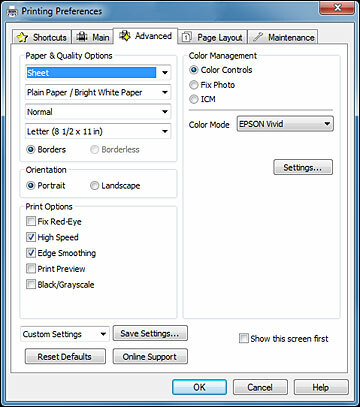 Select print settings on the Advanced tab to customize the quality and color settings for your printout, and save your own printing presets. Make sure Sheet is selected. Select the type of paper you loaded. Note: Check the paper type settings list for details. Note: Check the print quality setting list for details. Select the size of the paper you loaded. Select Borderless to print a borderless photo, or Borders to print a document or a photo with borders. Note: You must select a compatible borderless paper type and size to print borderlessly. Check the borderless paper compatibility list for details. Select Portrait or Landscape as the orientation of your document or photo. Note: If you are printing an envelope, select Landscape. Select any of the available advanced print options. Select any of the available color management options, or turn off color management.